This Google Maps mashup aims to have "the largest real-time airplane traffic coverage". I think they may have achieved that. The map shows the real-time location of planes using data from a number of different sources. 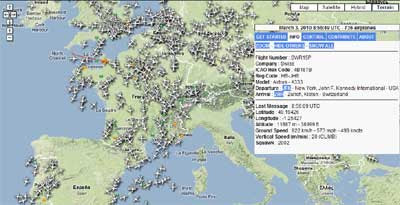 If you click on an individual plane on the map you can view information about the plane, its flight and view its flight path. It is also possible to view other layers on the map, such as international airports and the latest weather.